No doubt about it, flowing through a wing chun wooden dummy session is cool! This is sifu Alon Peterson at normal speed (not fast motion video). I wish I could flow smoothly like that, don't you? And look at his smooth footwork. This is the goal when you train on a Wing Chun wooden dummy. In his book, The Outliers, author Malcolm Gladwell repeatedly mentions the “10,000 Hour Rule” as the key to success. To be an expert you need to practice your skill or art for at least 10,000 hours. 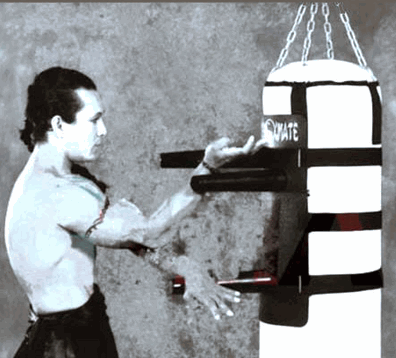 Training on a Wing Chun dummy quickly adds time toward your 10,000 hours Wing Chun mastery. Read the rest of this article, which is more like a short wing chun wooden dummy book and buying guide. I use the words Wooden Dummy, Mook Jong, Wooden Man, and Muk Yan Jong interchangeably. Why? So get used to the lingo and have an easier time talking to anyone about the Wing Chun Dummy. I've included an interactive table of contents below so you can quickly jump to the areas that interests you most. However, I also suggest you read the complete report to sharpen your Wing Chun knowledge. Mounting Your Wooden Man: Frame or Free Standing? A Wooden Dummy is similar to a tall piece of wood furniture. You have to put it somewhere and it's heavy, so you're not going to move it often. How are you planning on standing this up? Your two main options is to mount it onto a frame or have it free standing (similar to an old time Grandfather clock). A free standing wooden dummy takes up less space, which makes it practical for smaller areas. Typically, and dummy's base is weighed down to keep it from tipping over while training. Frame mounting is most practical for training, but takes up the most space. Frame mounting comes in two flavors. Free standing frames (which takes up the most room) and a frame that attached to a wall. Of course, if you use a wall mounted frame, you have to make sure your wall can hold it securely. The weight of the dummy, the frame, plus you practicing on it will tax your wall. In which case, you need to make sure you can securely install it onto your wall. A Wing Chun wooden dummy is like wood furniture. You have choices on the type of wood yours is made from. The type of wood affects its durability. Harder wood typically lasts longer, possibly for generations. One of the Wing Chun dummy's at my kwoon came from Grandmaster Cheung. It's lasted two generations so far. Softer woods, especially if you train hard, may not hold up to the abuse. Like wood furniture you can buy solid wood or laminate (pieces of wood held together by glue or other methods). Solid wood is preferred and will hold up to abuse better. Location is important too. If you keep wood furniture near a drafty window that gets a lot of direct sunlight, it will need treatment to keep it in top shape. Wooden dummies used at home probably have a tougher life than those found in a kwoon. Many owners keep their wooden dummy in the garage or an outside work shop, some will even keep it outdoors in a covered patio. These kinds of locations have wide swings in temperature (boiling hot in the summer, ice cold in the winter), humidity, dryness, and exposure to the sun or wind. Environments like this can cause your dummy to age quickly, develop cracks, and need constant maintenance. The rule of thumb is if it's a comfortable environment for you, it'll probably be a comfortable environment for your dummy. I have a friend who keeps his laminate wood dummy in a converted garage used as a storage room. He moved things around to make room for his dummy and some training space. In less than a year, his dummy started cracking and splitting. I personally prefer parallel arms so I can train both sides evenly. At my kwoon, we have three Wing Chun dummies. Two have uneven arms, one has parallel arms. It's nice being able to train on both, but I prefer parallel. Ask you sifu if your lineage has a preference. Many do. If not, go with parallel arms. Muk Yan Jong Size: Does it Really Matter? If your lineage or sifu has a preference, then stick with it. Otherwise, I believe it's personal preference. Ask your vendor what options you have. Some vendors may even custom build one to your specs. The one thing I enjoy about a wall mounted dummy is that most frames allow you to raise or lower the height of the wooden dummy a bit. But I've never seen a convenient way to do this for free standing dummies. 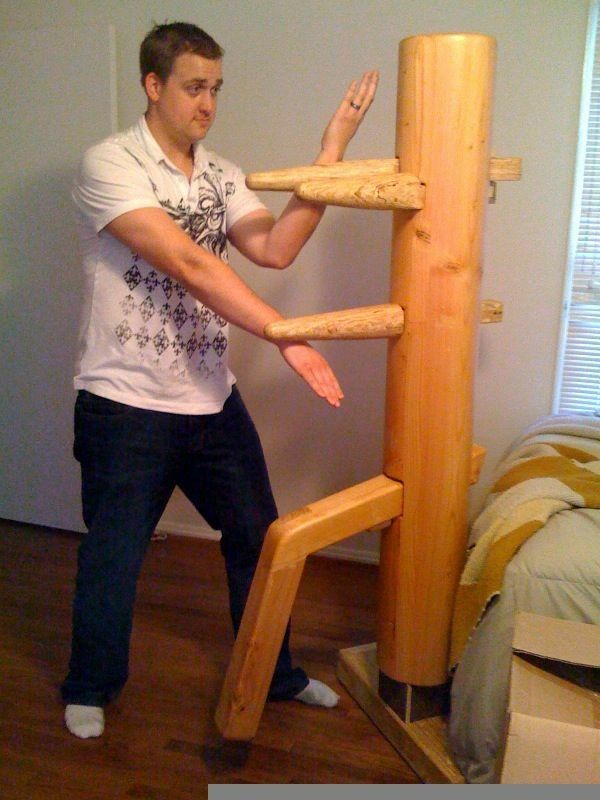 Buying a Wing Chun wooden dummy is an investment. So whatever you do, buy the highest quality muk jong you can afford. Wood Quality: Hardwood cost more than softwood. That's a given. But they also hold up to abuse better. Oak and ash are common hardwoods used in the US. Certain hardwoods can hold up to the environment (cold, heat, humidity, dryness) better with less maintenance, too. If you use your Wing Chun dummy indoors, this may be less of an issue. But if you keep your dummy outdoors or in a drafty or poorly insulated room (i.e. garage, storage shed) then teak wood may be a good option since it holds up to the environment well. In any case, take care of the wood and your dummy will take care of you. Wood Laminate: Just as plywood or laminate wood costs less than solid wood furniture or solid wood floors, the same applies to Wing Chun dummy construction. Wing Chun dummy bodies made from laminate (wood pieces held together with glue or other methods) tend to cost less. I've only used one in my life and it got a huge split that wasn't repairable. However, you'll find top quality and poor quality laminate designs and manufacturers. Choose one with good reviews. Compact Dummies: Some vendors and manufacturers sell wooden dummies that have regular sized limbs, but the body is smaller than average. Less wood means less cost. PVC (plastic) Dummies: As you can imagine. Dummies made from PVC/plastic will cost much less than dummies carved from solid wood or even wood laminate. In most cases, the limbs made from wood while the body is made from plastic/PVC. I used an early version of a PVC dummy and did not like it because it was too light. However, today's manufacturers have improved PVC dummy design and this could be a viable and affordable option for you. Alternative Dummy Designs: Depending on your needs, you may not need a full scale Wing Chun Dummy. Often, these special use dummies cost less than traditional dummies. We'll discuss this more a little later in this report. Shipping: Dummies are heavy and packaged in an awkward shape. Sometimes, if you can drive and pick yours up, you could save a bundle; and have a great road trip story to share with others. One of my buddies (below) bought an oak dummy from a carpenter in the Midwest (U.S.A). The carpenter suggested my buddy could save $400 if he picked it up himself. It would have a been a great trip, but he couldn't take time-off from work. Sometimes, your purchase includes shipping. But if this is the case, be aware that the shipping fee is probably rolled into the dummy price. So work out your "out the door" price. 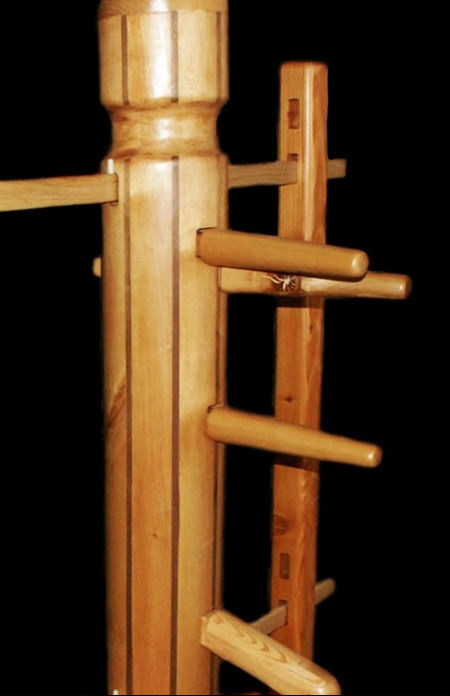 Build Your Own Wing Chun Wooden Dummy: If you're handy, you can build your own dummy and save on all the labor costs and buy the material when it's on discount. Check out this build your own wing chun dummy video guide, including the materials list. In today's marketplace you'll find creative mook jong designs that fill special Wing Chun training needs. Compact Mook Jongs take up much less space, yet give you the feel of a sturdy muk yan jong. The arms and legs are regular size, but the trunk body is much shorter (in some cases about 48 in/122 cm). Special dummy designs such as Dragonblast Flat Board Wing Chun Wooden Dummies to help you train like you would on a dummy, but open up many more possibilities too. Then there are a number of "dummy" designs that help you train specific areas of Wing Chun. JKD wooden dummy design that carves narrower neck area. The Octopus wooden dummy looks odd but adds new possibilities to training on a muk jong and even allows two students to train on the same dummy at the same time. Removable attach the arms, such as the Attachmate: Wing Chun Dummy Trainer, to a heavy punching bag and create a more dynamic training regimen. I have to be honest. When I first saw this option I thought it was a joke. Then a Wing Chun cousin brought his to the kwoon. We attached it to a heavy bag and it was awesome. The heavy bag swings and therefore the arms act like knives forcing you to really move to deflect and counter. The only downside is it has no leg. As is Wing Chun, you'll find many Wooden Dummy forms. I've found dummy forms with 108, 116, and even 138 movements. Likewise, you can find wooden dummy forms broken into 8 or 10 sections. There are probably other variations out there. The best bet is to ask your sifu for suggestions, stick to resources published by members of your lineage, or choose training videos produced by well known and respected sifus and lineages. 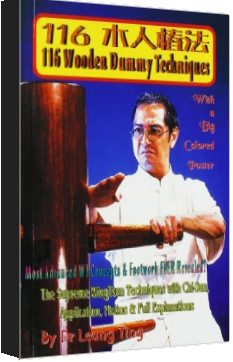 One of the best resources to find Wing Chun wooden dummy form and application videos is the WingChunLife Video MASTERY library. 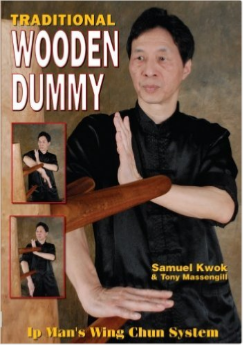 Sifu Gary Lam's The Complete System of Wooden Dummy training video is a popular choice. Another great choice is sifu Wayne Belonoha's Mook Yan Jong bundle. And one more Wooden Dummy form worth looking into would be sifu Sergio's Ip Man Series: 116 Wooden Dummy form. The purpose of Wing Chun dummies is to prepare you for combat by allowing you to get in the hours necessary for success and to allow you to practice by isolating your techniques one at a time. The dummy helps you develop Wing Chun skills: correct angle of deflection, balance, flow, accuracy, timing, positioning, speed and power. The timing and power of all fighting techniques can be drilled repeatedly on the dummy. Your dummy doesn't get tired or bored. Footwork is fine-tuned and balance is enhanced through deliberate practice of the forms, without having to react to a moving opponent. It has been said that an average martial artist will spend 80% of his time training alone. Don't waste your solo training time. By using your wooden dummy, you can maximize your solo training benefits, bringing you closer to your peak physical, mental, and spiritual awareness. Muk jong books are great resources because they often go into more detail and give additional background. A great place to find Wooden Dummy books would be Amazon. 116 Wing Tsun Dummy Techniques as Demonstrated by Grandmaster Yip Man by sifu Ip Chun (Ip Man's son). 116 Wooden Dummy Techniques (Muk-yan-chong-fat) by sifu Leung Ting. This is an updated version of the original book above. 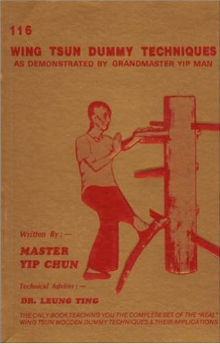 Traditional Wooden Dummy: Ip Man's Wing Chun System by sifu Samuel Kwok. 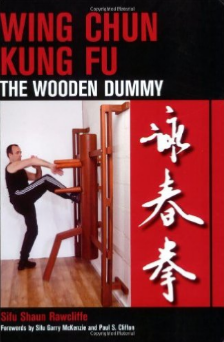 Wing Chun Kung Fu: The Wooden Dummy by sifu Shaun Radcliffe. One of the more popular legends behind the wing chun wooden dummy's origin says it came from the ancient Shaolin Temple. About 300 years ago, before the Manchu government burned the temple to the ground, the temple had a tunnel with 108 individual dummies. Practice one move on one specific dummy; talk about practicing one move 10,000 times! In order for the monks to graduate, they had to pass through this tunnel and successfully neutralize each dummy, which represented being able to complete each of the 108 combat techniques. Ng Mui, the buddhist nun and matriarch credited for founding Wing Chun Kung Fu in many lineages, escaped the Manchu attack and survived the Shaolin Temple's burning. She took many kung fu secrets with her, and also combined all of the individual 108 wooden dummy combat techniques, and unified them into one training set (Wing Chun form) that could be trained by using just one wooden dummy. Originally, Mook Yan Jongs were made from tree trunks that were set in the ground with gravel so they would give slightly when struck. Modern wooden dummies are made from various types of wood, with teak, a hardwood, being quite sought after. Many craftsmen make Muk Jongs that are both functional and beautiful works of art. Just like a fine piece of furniture, though, Wing Chun dummies cost a pretty penny. In general, you'll want to favor dummies made from hardwoods like teak, oak, hickory, ash, and others. These hold up well over time compared to softer woods like pine. At my kwoon we have three wooden dummies. The hardwood one is teak and belonged to our grandmaster. The dummy traveled across the Pacific Ocean to the U.S. and was used by my sifu's sifu. And now, my sifu inherited it. That's three generations and two continents. It's close to 40 years old. The leg on it broke, but was recently repaired with a metal splint. It's still going strong. The second dummy is about 10 years old, made out of some cheaper, laminate wood and stained dark. The main body (the trunk) already has a nasty split where the double arms come out. I don't think it can be properly repaired (the log is split deeply). No matter what you do, I recommend investing in a quality dummy. You'll be able to pass it on to the next generation. And like a good piece of heirloom furniture that gets better with age, you can sell it. What's more, hardwoods, like precious metals, go up in value over time. What is the Wing Chun dummy called? The Wing Chun dummy has many names in English. What you call it depends on your lineage. But they all refer to the same piece of equipment. It is commonly called a Wooden Dummy, Wing Chun Dummy, and a Wing Chun Wooden Dummy. And depending on your lineage, you may even call it a Wing Tsun Dummy. Calling it by its Chinese name creates a few more variations. For example, from Cantonese - Mook Jong or Muk Yan Jong. From Mandarin - Mu Ren Zhuang - 木人桩. Literally the name means Wooden Man or "Wood, Person, Post (stake)." Is there a difference between a Wooden Dummy and a Wing Chun dummy? Not necessarily. It is the name we give to this piece of Wing Chun training equipment. Are all wooden dummies the same? Is there one standard design for a Wing Chun dummy? Not necessarily. It's like asking if all boxing gloves are exactly the same, or if boxing gloves come in one standard design. Wing Chun dummies, like boxing gloves, can come with slightly different designs and sizes. It depends on how you plan to use it, what your sifu recommends, and your personal preference. What is an Ip Man Wooden Dummy? It's the most common style or design you'll find in the marketplace. A thick trunk representing the body. A limb representing the lead leg. Three limbs to represent the arms. Two near the top representing the left and right arms. One below representing one arm in a lower position. Some lineages prefer the upper arms uneven horizontally, while other lineages prefer the upper arms to be even horizontally. In JKD (Jeet Kune Do), which has roots in Wing Chun, but not considered Wing Chun, they like their wooden dummies to have a neck and head carved into the main trunk.